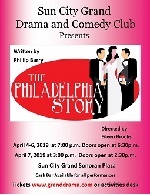 This classic romantic comedy focuses on Tracy Lord, a Philadelphia socialite who has split from her husband, C.K. Dexter Haven, due both to his drinking and to her overly demanding nature. As Tracy prepares to wed the wealthy George Kittredge, she crosses paths with both Dexter and prying reporter Macaulay Connor. Unclear about her feelings for all three men, Tracy must decide whom she truly loves. In the movie version, Jimmy Steward won an Academy Award for Best Actor.